Born in Arkel, Netherlands, Frenkie De Jong started his football career at Willem II and he was signed by Ajax in August 2015 for €1. You read it correctly, 1 euro. He was then loaned back to Willem II until December 2015. He returned to Ajax in January next year and made 15 appearances. Since then he continued playing at Ajax and his breakout season came last season (i.e. 17/18). He made 22 appearances registering 8 assists as a midfielder. The 21-year-old has been signed by Barcelona for €75 million + 11 million (add-ons) and will start playing for the Catalans from July 2019. There are a number of aspects of him to talk about so let’s take a look at them one by one and know what makes him such a special player. From the prima facie view of his career, the first comment that can be made about him is that he is versatile. De Jong plays as a central midfielder who can be played in a double pivot or on the left-hand side in a 3 man midfield. He has also played on the right and can be used a CDM if needed. So, he’s basically a midfielder comfortable in more or less any position in the midfield. Add to that he has also played as a centre-back for Ajax in the 2017-18 season. But it will be fair to say the midfield role is what brings the best out of him. De Jong frequently scans the pitch while playing to select the best passing option available. He knows the best man to pass the bass often before receiving the ball. He looks over his shoulders often to be more alert of the opponents. His awareness is a chief reason behind his great vision. Resisting pressure is one of his main attributes and he does it very well because of his great control on the ball. He’s a player with tremendous technical ability and spatial awareness; hence his ball retention skill can be trusted highly. This attribute is very useful for teams which play possession-based football. Shielding the ball with the outside of his right foot, he makes sure the opponent doesn’t get a whiff of the ball. His intelligence to find the right pass in tight spaces is commendable and this helps him to evade the press. By changing direction and performing feints he has honed this ability to resist pressure and taking on opponents. Frenkie likes to receive the ball from deeper areas and drive forward with confidence into the opposition territory. By the dint of his good dribbling ability, he carries the ball effortlessly. When De Jong moves forward he forces the opponent to either lose his marker or let him venture deeper into the opposition half. When the opponent gets drawn toward him, it frees a teammate and hence enables a passing option. De Jong is a master of short passes and he boasts a passing accuracy of 92% in the Eredivisie this season. His awareness and technique enable him to perform the one-touch passes with high accuracy. This doesn’t mean his long-range passing is any less good. He has the ability to deliver line splitting passes and long balls that breaches the opposition midfield and even the defence often. This virtue of his, is a juxtaposition of his awareness, vision and technique. Thereby he also has a creative facet to his qualities. The video below nicely encapsulates his awareness, linkup play, and long-range passing. Defensively it can be said he covers large spaces of the ground and tracks back well when needed. He makes many interceptions and tackles to recover the possession for his team. His awareness again helps him here to block the passing channels and eventually intercept the ball when the pass is made. De Jong is a player who likes to keep the ball and takes his time on it. This sometimes leads to two possibilities, either the ball is taken off him when a lot of pressure is applied or he could slow down the tempo of the game; which is the last thing one wants during the counter attack. Besides, he avoids contact when defending i.e. He is not the player who goes very physical while challenging the opponent. This lack of physicality is something which also makes him weaker in duels sometimes. 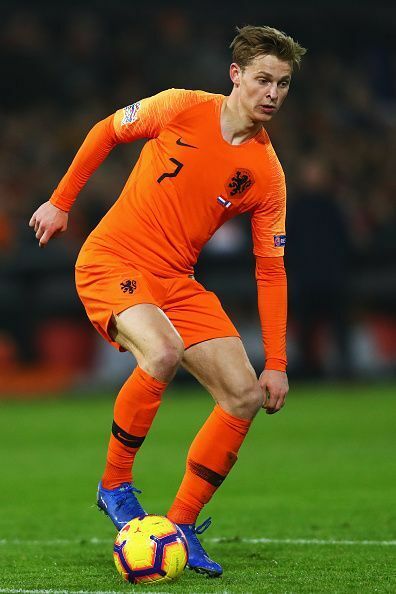 In conclusion, considering all the qualities of this young sensation it will be fair to say that Frenkie De Jong is a well-rounded midfielder and his qualities make him a perfect fit for a club like Barcelona. His career at Ajax has already given him a head start to adapt to the Barcelona style i.e. the possession based football. He has also been likened to one of the greatest 'Registas' in the football world; his soon to be team mate Sergio Busquets. Taking into account his style of play and ability, it won’t be a surprise if we see him taking the CDM role for Barcelona in a few years time. As he takes his next step to Barcelona we are should prepare ourselves to see an out of the world level of press resistance in the trio of Frenkie, Arthur and Busquets.